What would drive a man to take his family across the country and set up in a squatters’ camp in the desert where the average temperature was 116 degrees? The three D’s: Desperation, the “Dust Bowl” and the (Great) Depression. During the 1930s, thousands fled to whatever Promised Land offered a job. A drought turned their land into a “Dust Bowl” and rendered it useless to grow crops and to make a living. This forced thousands to leave their homes in a five-state region of the Great Plains in search of work. Two years before construction began on Hoover Dam in 1931, the area near Las Vegas was flooded with job-seekers. They lived in Ragtown, a makeshift shantytown on the floor of the Black Canyon next to the Colorado River. Their “homes” were made of tents, cardboard boxes, tin scraps and anything that amounted to shelter from the scorching heat. Six Companies Inc., a “supercompany” made up of six construction firms, agreed to build the dam for just under $49 million. The Boulder Canyon Project authorized Hoover Dam for flood control, improved navigation and regulation of the Colorado River. 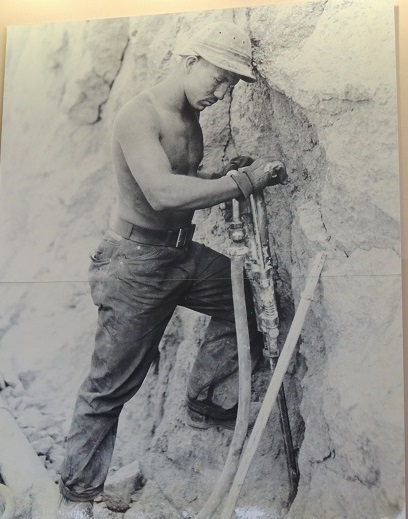 Temporary housing was built in Boulder City for those who would work on the dam. The homes – 658 of them – were called “dingbat” houses because of the quick and shoddy way they were constructed. The boxy homes had a living room, a bedroom and a bathroom. Two men could throw one together in about 12 hours. They looked so much alike that it wasn’t uncommon to wake up and find a stranger sleeping on the couch. When he was awakened, he’d look around bewildered, get up and head for home. “The dingbat houses were a great improvement over the squatters’ camp, but the ragged construction style created hazards of its own. Dust blew in thru the cracks in the walls and doorways, piling up against the houses, creating small dunes throughout the neighborhood,” according to “Boulder City,” a PBS documentary. Despite the hardships at home and the hazards of dynamite blasts at work, the workers at Six Companies completed Hoover Dam two years ahead of schedule and well under budget, says U.S. Department of the Interior Bureau of Restoration. Hoover Dam is 726 feet tall. That’s 171 feet taller than the Washington Monument in Washington D.C.
At its base, Hoover Dam is as thick (660 feet) as two footballs fields measured end-to-end. Lake Mead, the largest reservoir in the USA, contains enough water to flood the entire state of New York with 1 foot of water (26 million acre feet). Between 1931 and 1936 when the dam was built, 96 men were killed in industrial accidents. None were buried in the concrete. Finished early and under budget? That doesn’t happen anymore! Wow a lot of deaths! It is very interesting to know the history, thank you for sharing it with us. Many deaths, true, Diana. But, given the conditions they were working under, it’s surprising there were not many more. Yes, Judy, it is amazing! Fantastic post, very informative. I wasn’t aware of the story about the dog, either. Thanks for the great history lesson this morning. Thank you for your comments. It was fun finding out the story behind the construction of the dam. Thanks so much, it’s a cautious mix of feedback so far. I’m surprised at how many get funny about change. It’s been interesting to collect the feedback. What a fascinating story this one was. As a Canadian I knew only bits and pieces of the Hoover Dam history but you have woven the full tapestry. Thank you. Interesting story about a site I visited years ago. Some observations: According to your description, the dingbat houses lacked a kitchen. Now I know why the word dingbat is such a disparaging epithet – something ‘s missing! And, who knew the undertaker would be the busiest man in town. Your post proves the back-story is always more interesting than what we read in history books. Thanks, Judy! I love the sentimental touch of the dog tribute. Under such grueling conditions, I’m sure that canine provided much-needed cheer. My grandmother’s foster sister was born in a dingbat house, Judy. And her foster father allowed them to keep a dog to bark and warn the women and children (and new baby) to be on the watch while the men were off working. My grandmother said they fed the dog leftovers, but since there weren’t many leftovers, they made a little extra oatmeal or cream of wheat, and the dog ate that. Great post. Your pictures rounded out the few my grandmother had in her memory album. Our tour bus drove thru Boulder City on our way to Hoover Dam. I wish I had my folks’ address when they lived there and had a chance to look at the home they rented. The area is an historic site now – not sure how long this has been the case though. Marilyn, from the descriptions I read, they went thru hard times. It was not easy living there then, but those dingbat houses were shelter. I’m sure the dog was a great comfort, especially with so many strangers in the area. We need public works projects like this now. One figure has 40,000 bridges in disrepair some even crumbling. But they spend millions a day on stupid wars that have not made anything better in the slightest. One I would do is plant millions of trees putting thousands to work on federal lands – The Reforestation of North America Project. A dust bowl and a depression. Would people have the stamina and resilience to survive that today? I hope the next time I’m tempted to whine about some minor inconvenience in my life, I think of this post. Thanks, Judy. The folks in the 1930s were a hardy lot and many weathered the storm. My Mom’s Dad passed during the early part of the Depression, leaving his wife with nine kids. They got thru it by working together. Charles, I hope that we will find that we’re tough enough to get thru the hurdles in life long before a situation like this arises. Fascinating history earthrider! We stopped in Boulder City, Nevada once and thought what a nice little town it is now. The dam has had some magnificent and amazing upgrades too. Dor … Thank you. It was fun learning about the beginnings of Boulder City and Hoover Dam. From what I just looked up online, it appears that the Boulder City Historic District was put on the National Register of Historic Places in 1983. At that time, the district included 514 buildings and structures, most of which were constructed between 1931 and 1942. There are a lot of ancient buildings where I live and some are nearly a 1000 years old now, I’m not keen on a lot of the heavy religiousness that our city cathedral has, but I take a look at those intricate patterns in the ceilings sometimes and try to look at it as art and appreciate all the hard work that went into those many years it took to build that huge ornate building. That poor dog!!! I bet the driver of that truck was popular after he rolled the wheels over that beloved dog – that must have been terrible day! Actually the Dingbat housing estate, to me, looks like many of the housing sites they cram in together now. Not very appealing. Yes, snakes and many other critters you wouldn’t want to entertain in your home. 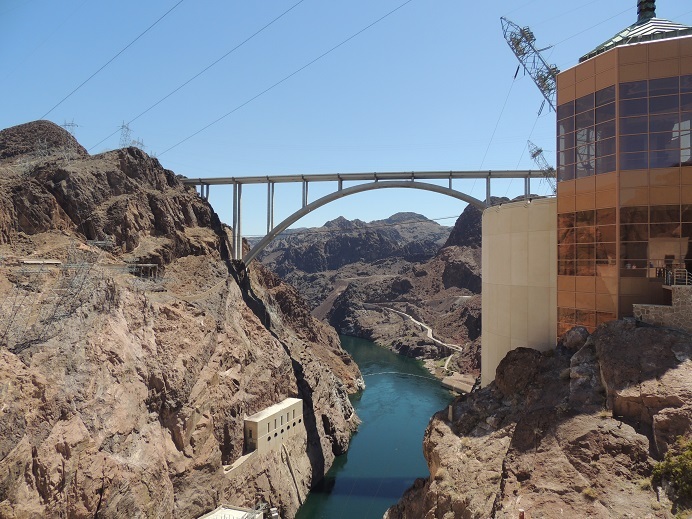 But the Hoover Dam that they worked on is an engineering marvel and many died to make that site happen. Those who worked there definitely mattered. I think of them in the same vein as those who built the pyramids. Amazing work that was built to last. Suzy … I agree. What a sad, terrible ending for that dog. I also feel bad for the driver of the truck that rolled over their mascot. That man must have felt terrible. 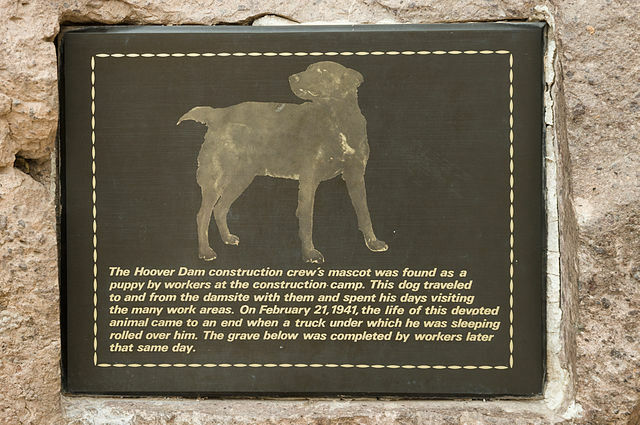 It sounds like the dog was a true companion to all those who worked there. Great post, Judy. I remember the first time I visited the dam being overwhelmed at the magnitude of the thing. The story of the dog is so touching. Can you imagine being the guy that rolled over him? Interesting backstory about the dog’s name too. Yes, the most interesting history never seems to reside in the textbooks. Thanks for this marvelous post. Barbara, I know I’d be heart sick if I was the guy whose truck rolled over that dog. I’m sure he was, too. I was very lucky to have a few history teachers like that. One in particular who brought Ancient Rome to life and ignited a fierce interest in history which is with me still. I’ve never understood people who say “Oh, that was before my time…” and dismiss it as if it weren’t relevant to life right now. Of course every moment of history is relevant to our current lives. That’s what good history teachers manage to get across. I know what you mean Barbara. I had a few history teachers that inspired me to want to know more. My Mom’s keen interest in history certainly added to that quest. When I started teaching English Language Arts, I asked to sit in on lessons that the history teacher on my team was expanding on about the Holocaust. It’s a required subject in the state of Florida, but the history book had only a few scant paragraphs about it. She brought the subject to life by having the kids role play and do activities related to it – such as making butterflies in connection with the book, “I never saw another butterfly,” which is a collection of children’s drawings and poems from Terezin Concentration Camp, 1942-44. Thank you for that very informative post Judy. Few of us spare a thought to the sacrifices of those that worked to make these architectural feats possible. The workers’ efforts made these architectural marvels possible. Many died so that it could be completed. Like those who built the pyramids or bridges, they should not be forgotten. Glad you liked the post, Madhu. Beautifully stated, Island Traveler. I heard many stories about the Great Depression from my folks when I was growing up. My Mom’s Dad died about 1934, leaving his wife and nine children. I know it was a struggle for them. Times when there was little to eat. Times when they all pulled together to overcome the hurdles. I hope you’re right. I hope that people will learn from this experience. This maxim is true: If we do not learn from history, we are condemned to repeat it. You’ve done a very difficult thing here, my friend: you’ve made history come alive, and given it a very human face. Your research and writing skills are on full display here. These are the kinds of stories that really instill a love of history. I knew next to nothing about Hoover Dam. To call it a fascinating story would be an understatement. Your choice of photos was perfect– they enhanced your text beautifully. Many thanks, Judy, for a truly wonderful post! P.S. Loved your Vegas post, and the one that sketched out your blogging history as well. Sorry I was a little too late to leave comments on them! !